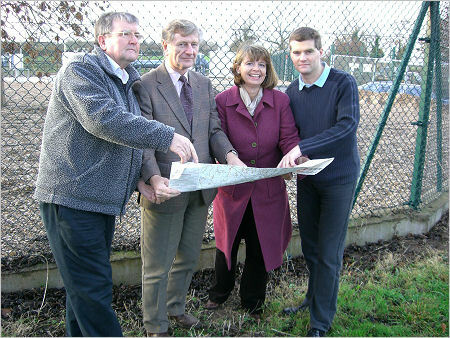 Harriett Baldwin, Conservative Parliamentary Candidate for West Worcestershire today criticised new proposals from the Government to change planning rules and weaken the say of local communities. The policies were unveiled by Whitehall ministers in a Planning 'White Paper'. Sewage plants, power plants and incinerator chimneys dumped in your neighbourhood: A new centralised planning quango will strip local communities of any say not just over airports, power stations and motorways, but also on incinerators, sewage plants and hazardous landfill sites. The recent National Grid pipeline inquiry over the Pressure Reduction Installation at Corse which has just concluded taking its evidence would be an example of the kind of local consultation affected. Its powers also include compulsory purchase of land. Unsackable quangocrats: The new unelected 'planning commissioners' will effectively be unsackable and unaccountable. The Government propose fixed eight year terms, and no ability for their removal on grounds of their decisions - giving a green light for the quangocrats to ignore public opinion. Supermarkets favoured over small shops: Controls will be weakened on out of town development, giving the dominant supermarkets even greater power over small shops and local high streets. However, Harriett Baldwin expressed an open mind on proposals to make it easier for households to build an extension - provided that neighbours were still given the opportunity to object if it affected their property or local amenity. "After ten years of Labour in office, the number of people who own their home is now falling. Labour's regional planning red tape and Whitehall targets have snarled up the planning system, whilst restricting the say of local residents. Ever higher stamp duty and soaring council tax have made it harder for people in Worcestershire to get a foot on the first rung of the housing ladder. "Gordon Brown has shown his true control freak instincts by backing moves to strip local communities of their say over incinerators, rubbish dumps and sewage plants. Labour has sided with large developers, rather than the people. "Yes, the planning system needs reform and we need to build more homes. But the voice of local communities must be preserved and a democratic, accountable process must be maintained." Photo: Harriett Baldwin and Mark Harper MP for Forest of Dean meet with concerned local residents at the site of the National Grid PRI in Corse.